The Radial Tonebone PZ-Pre is the most powerful acoustic preamplifier ever to be put inside a pedal. And when we say acoustic, we do not just mean acoustic guitar; we mean ANY acoustic instrument including banjo, violin, cello, mandolin, contrabass, bouzouki or lute. The magic of the PZ-Pre lies in the combination of high performance 100% discrete class-A piezo boosters, an ultra-quiet preamp circuitry that will adapt to any pickup system and a host of connectivity options that put you in control of any situation. The PZ-Pre features two inputs for quick instrument changes on stage, a powerful yet warm sounding semi-parametric EQ to tailor your sound, plus a host of feedback eliminating controls including: a dual-Q notch filter to surgically remove feedback points, a high-pass filter to cut low frequency resonance and a phase reverse switch to optimize the acoustic environment on stage. The PZ-Pre is equipped with three separate outputs: a " on-stage instrument amp out, a balanced XLR pre-EQ direct out for the house mix and a balanced XLR post EQ out for stage monitors or in-ears. A dedicated tuner out with mute switch is provided for quiet on-stage tuning as well as an effects loop and power booster to add sizzle and dynamics to the performance! Banjo player here chiming in: I've had my PZPRE for going on 5 years now, only once did it ever let me down, but after speaking on the phone with the technician working on my warranty claim he assured me he had never in all the years of that product being on the market, this was the first to come in for that particular issue. (During a gig I switched to an electric banjo to do some duty as a weird noise wizard. When I hit the Boost switch to turn on my FX Loop, it popped in my monitor and the banjo was dead in the water the rest of the night). Besides having a killer warranty, this product is pretty much unmatched as far as an acoustic pre-amp/DI/EQ solution box. It's saved my life playing banjo in noisy bar rooms with a drum kit and electric guitars and basses many times. I only have 2 criticisms of the pedal itself. 1) I wish the power supply was either 12 or 18v so it works nicer with most readily available pedalboard power bricks. 2) I wish they made it a touch deeper so that they could fit another row of EQ knobs for the second input. 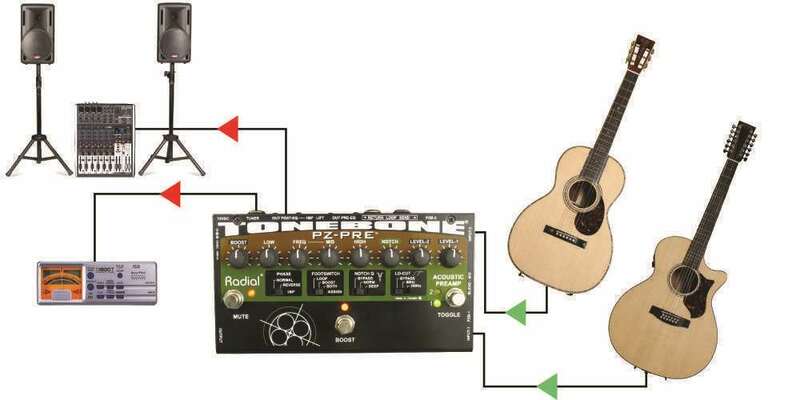 If you read the manual, it unfortunately states that input 2 doesn't get any EQ so you need to source an external pedal to dial in another instrument or pickup source. Rather inconvenient given the price and size of this unit in the first place. I didn't want to have to track down another EQ pedal that's this quality AND find a way to fit it onto my pedalboard. However, if you're a one instrument kind of player then this point is moot. I'm using it for my Vector Bass upright electric. Unbelievable control for my piezo bridge pickup. I especially like the notch filter to dial out those "honky" mids or dial them back in when required. Wicked quality and great functionality. I have a 2 guitar setup. This is by far the best product for my aplication. I have multiple pedals run through the effects loop and everything works perfectly! I have recommended this product to many friends. You can't beat Radial's quality. Built like tanks. Also. It's easy to find an alternate power supply if needed. 15v isn't that rare. I own this pedal--L&M found me a used on in their system and had it transferred over for me--but it came without a power adaptor. No biggie: power adaptors are all over the place. Wait a sec. It needs a 15V DC power adaptor!?! Nobody makes those except Radial for their ToneBone products. And my L&M didn't have one in stock. So I've had this unit for a week now and haven't been able to try it. Bummer (I know--not a big deal in the long run). 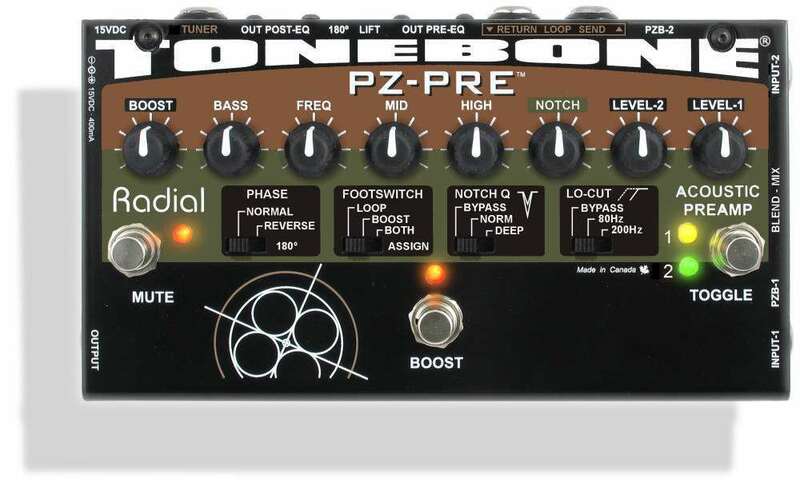 If you buy a Tonebone pedal, even if it comes with an adaptor, you may want to purchase an extra because if this one stops working or you lose it, you're out of luck until your local music store can order you a new one (did I mention that it doesn't use batteries?). I will review the pedal itself when I get the thing powered up.